The Tenement: One year on and The Green Room is finished. One year on and The Green Room is finished. I was curious to see how long I'd actually been working on this room and was shocked to find that it's been a few days short of a year! 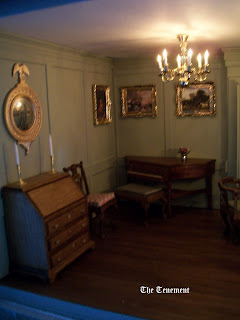 Going round the room from left to right - the bureau is a House of Miniatures kit and the little chair just tucked in beside it is an unfinished item that was varnished and upholstered. 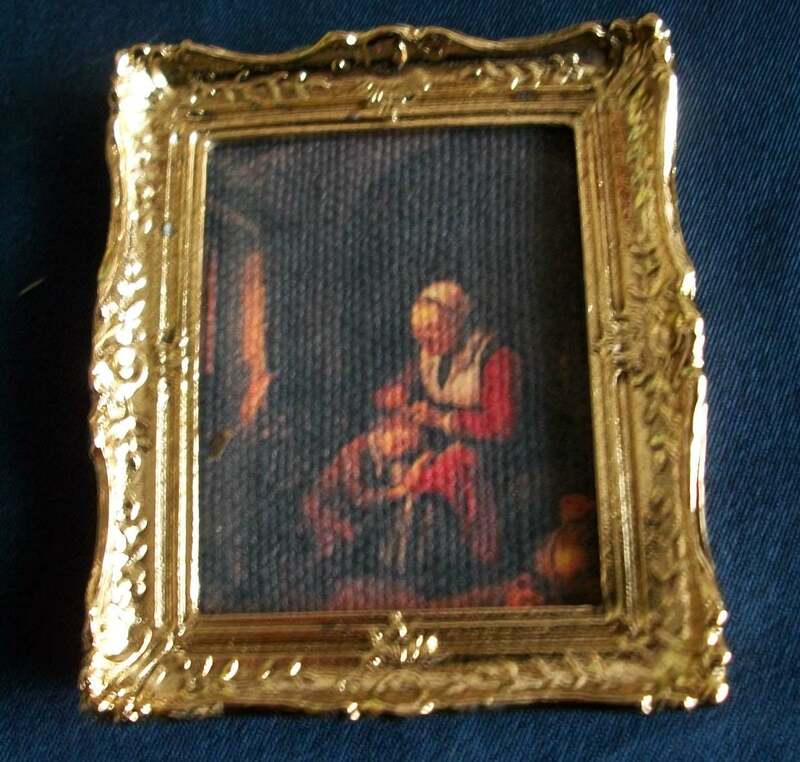 The painting on this wall is 17th century and entitled "Woman Picking Nits From a Child's Head". 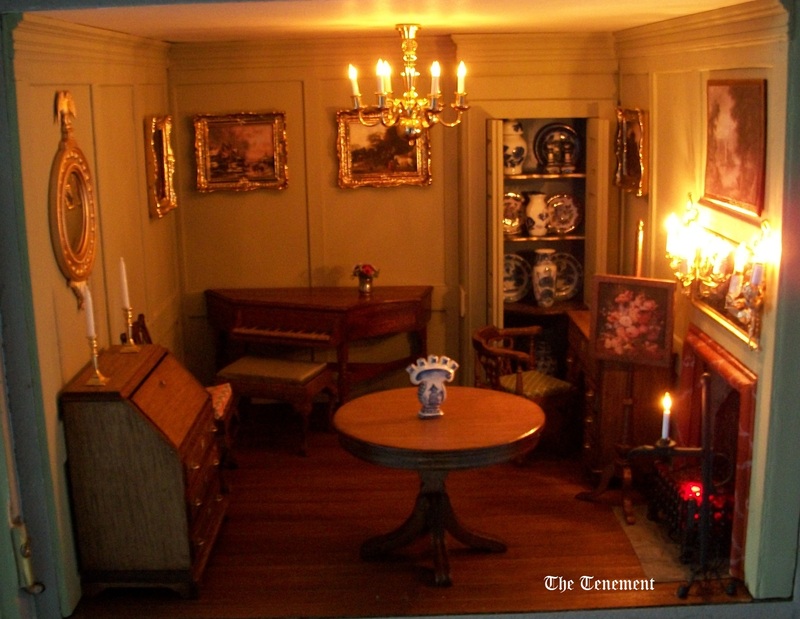 On the back wall, the spinet is a commission for me by Masters Miniatures. The space I had was too small to accomodate their regular sized version so they very kindly adapted their design for me. 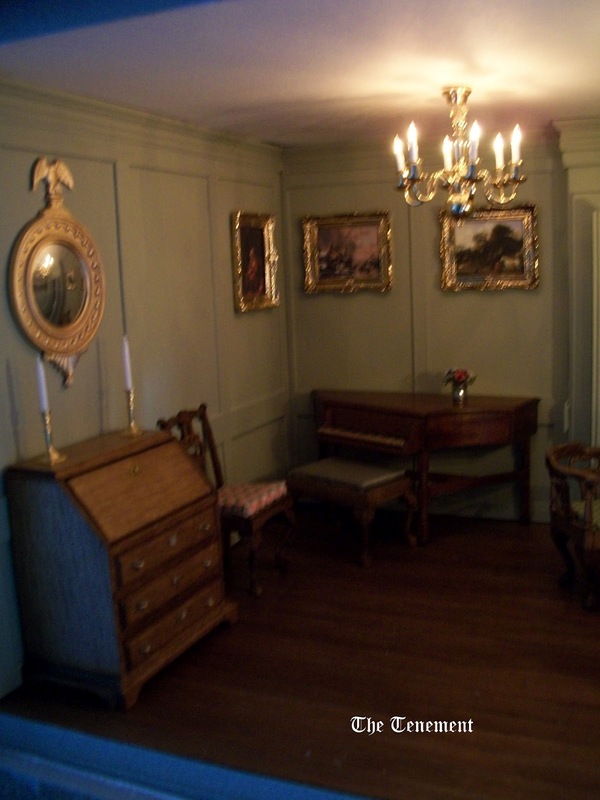 The two paintings above the spinet are also 17th century and painted by Dutch artists. I've shown these before but here they are in situ. The stool is a Mini Mundus kit. 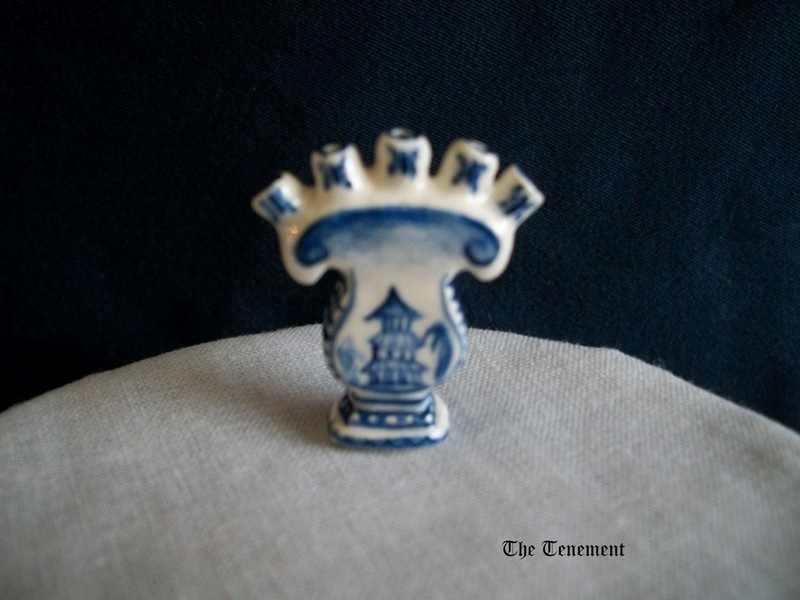 The blue and white china was collected from a variety of sources and there is also a little drop down table for display purposes. 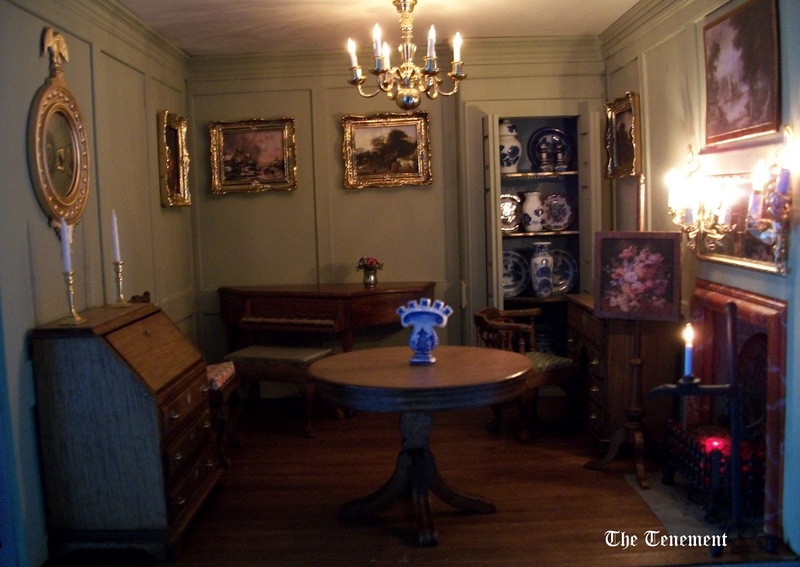 The painting on the right hand wall is again 17th century and painted by a Dutch artist. 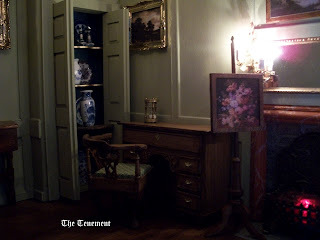 Below that features my William & Mary kneehole desk and a corner chair, again Mini Mundus. 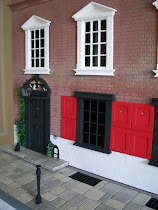 The fire screen is a kit by McQueenie Miniatures. Other than referring to it once or twice, I haven't said much about the Noire panel above the fireplace. James Norie was an Edinburgh based 18th century painter who worked for the Adam practice (Robert Adam). According to the literature available, the Italianate scene was painted in situ as part of a panelled room. A lot of his work was rescued during the slum clearances of the 19th century. 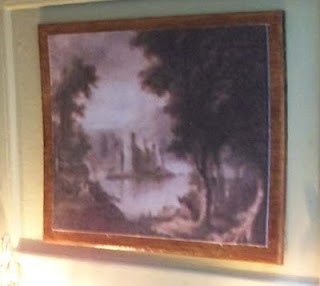 This picture is not the same as the one exhibited in the RL building but is another of Noire's works. The light sconces were made by me and the marbling round the fireplace was my first attempt. The candle stand is another commission, this time created for me by Olde Charm Miniatures. The tulip vase was purchased from Sally Meekin. There are only two remaining items required for this room - a brass banded bucket (which is proving to be pretty elusive) and a pair of fire dogs. *Reproduced with the kind permission of the National Trust for Scotland. You can see the RL Green Room here in the second picture. This is the last room to see in The Tenement that is a reproduction of the RL building. The final three are holiday lets but for my purposes (and because I have one more room and an attic space left to fill), my building will accomodate a lawyer and a cobbler. I can't tell the differenc from the real thing, it looks wonderful! It is just wonderful. 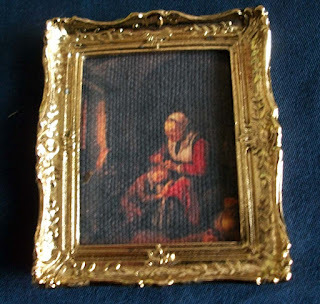 You really are a wonderful artist and a fantastic miniaturist. I love the setup of the room. Each piece of furniture is just right and those you finish are superbly done. I really admire your artwork Irene. Your Green Room looks excellent! It's a very faithful reproduction of the original, Top marks!!! The wall colour is a perfect match, the fireplace identical, and your choice of furniture fits in ver well indeed. I don't think it matters how long it takes to finish a room, if it ever is finished, taking a year to fully decorate and furnish a room is pretty good going in my book!! Congratulations on another excellent project!! 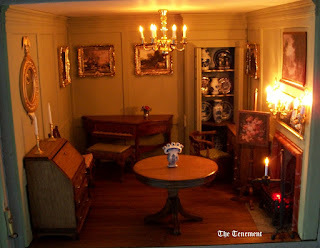 It is a wonderful room Irene, both in RL and in miniature! You have done a fantastic job replicating it in miniature. I really like how it works so well even though you have made it smaller, it has a very cozy atmosphere. As I said before, I love the colours in this room. Well done! I love Master Minatures and have brought a few things from them. Love your green room, it looks so real, you have an eye for detail. 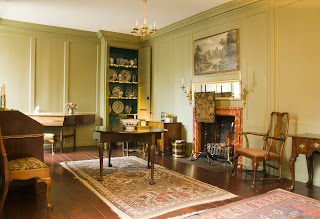 The room looks fabulous, you have taken time to collect or make just the right item to suit the setting. Irene, This is a Gorgeous Room!!!! 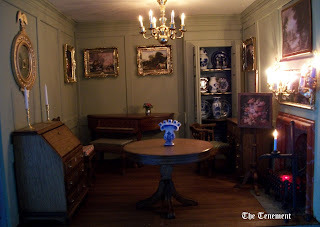 You have made such a wonderfully Faithful reproduction of the original room! The details of the furnishings and accessories as well as the overall structure and colors are so thoughtfully and carefully copied.... it all looks just Perfect!!! 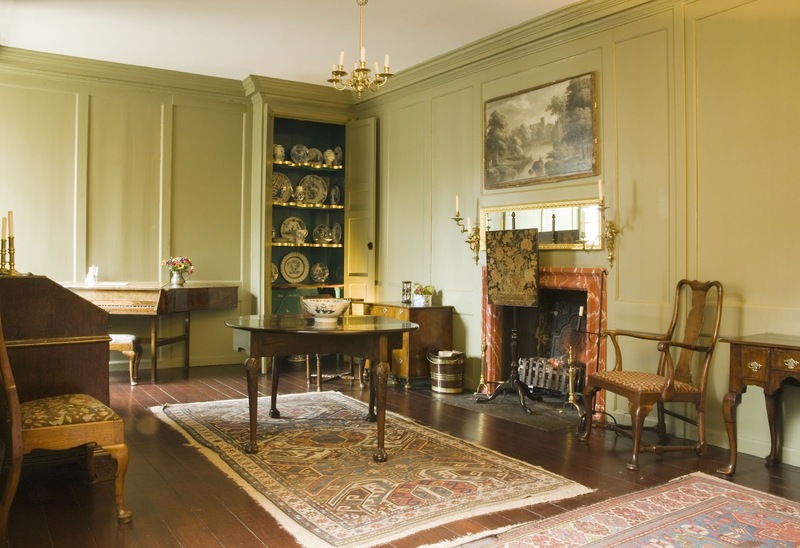 It is a Beautiful Period room to begin with and you have rendered it so well.... I just want to move in!!! It is really Beautiful.... I LOVE everything about it.... and with the lights on it just feels so warm and inviting! GREAT Job!!!! I'm just back from holiday, and couldn't wait to see your photos - all I could get on my mobile was the text, so I have spent the last week trying to imagine what it would look like... and it looks fantastic! The thing that jumps out at me is the impeccable panelling, you've done a brilliant job on it. So of course you've inspired me to think about some panelling! Amazing work! You did a great job with this room, even more so when we see the real room. I loved reading about all the details of the various miniatures in it. Sorry for being so late, I guess I neglected to 'follow' this particular blog of yours, though you must know by now that I am an ardent fan! OMG, what an inspiring room you have created --one of an exquisite collection of rooms in your tenement. And there's your spinet you mentioned! Looks great! All your beautifully curated items look fantastic in your elegant setting. I will be sure to add this to my list! Hello Irene! Here I am again! I also read this blog! I loved it so much! It 'a beautiful project and your job is exciting to watch. Your links are always extremely helpful and the teaching culture that emerges from this story is priceless! Thanks Irene! Big thanks yous everyone! I'm so pleased you like what I'm doing with this property and are enjoying the snippets I'm passing along. It's a fun project to do. This is a tremendous achievement, Irene. Not only are the individual objects first rate but the overall effect is really lovely. I had to really consider that first photograph to try to decide if it was the 1:12 model or your RL inspiration!